It’s not easy making choices, and it’s even harder when you’ve got a business that depends on them. Such is the case when trying to find the best enterprise file sync and share service for your needs. If you’re thinking about Egnyte vs Box, we’re going to help you decide between our favorite EFSS service and one that has many Fortune 500 companies as clients. Both are on our best EFSS list. Egnyte Connect is in first place for overall performance, while Box is third. We’re going to see whether the order holds true in this head-to-head, as well. If you’ve already made up your mind, you can refer to our separate Egnyte Connect review and Box review to learn more. If you’ve stumbled onto these EFSS services when, in fact, you need plain cloud storage, you should check out our comparison of the best cloud storage services and our best cloud storage guide to help you choose the right service for you. Over the next five rounds, we’re going to compare the services in different categories and see how they do. We will declare the winner at the end of each round and name the overall winner in the conclusion. How fast you sync your files depends on the cloud storage service, your internet service provider and how close you are to a server. A block-level sync algorithm helps, too, because it speeds up the transfer of files that have already been uploaded. Collaborating with others without it is tedious, to say the least. It’s best if you can limit your computer resources or bandwidth if the sync process takes too much out of them, as well. After you install the Egnyte Connect client, it adds a sync folder to your desktop. The content you put into the folder will be synced to the cloud, but also stay on your hard drive. You can use the service’s selective sync feature to switch off folders, files or hard drive storage, though, which will preserve hard drive space. It took us almost nine minutes to upload a 250MB folder. Other services take half as long. Initial upload is slow with EFSS solutions, though, and sync speed is more important for collaboration.In that case, a block-level transfer algorithm ensures that Egnyte Connect’s speeds are fast. Egnyte has another desktop client, called Egnyte Drive, that is basically a network drive you can use to get to your cloud content without storing it on your hard drive. It takes longer to open your files, but it’s more secure and prevents access to them if someone steals your device. Box’s desktop client also adds a special sync folder to your computer. It works the same way. Each file you put into it will get synced to the cloud, all your other devices and those of your collaborators. To help you free storage space, Box uses selective sync. As with Egnyte Connect, you can use it to limit sync to only content you’ve selected. You can turn off folders from syncing by using the web app, too. Box’s sync speeds compare well with other EFSS services on initial file uploads, but fall short when uploading existing files because it doesn’t use block-level sync. Considering that Box has such a big drawback that hinders collaboration, an essential part of using an EFSS service, Egnyte Connect is the obvious winner of this round. Cloud storage does not only help you make space on your hard drive. It also enables you to share your files with others. Collaboration in an enterprise setting is impossible without sharing, so it should be easy, capable and secure. By “secure,” we mean it should have proper content controls. You should be able to share to the big social networks, individuals and groups, too. With Egnyte Connect, you can generate links for folders and files, which others can use to download and view. The link can be copied and pasted to social networks or you can email it. After you generate it, you can protect it with a password, set an expiry date, restrict downloads and get a notification when it’s used. There’s also a page that shows what you’ve shared. Viewers can preview and download; editors can edit, upload and download; people with full permissions can upload, download, edit and delete; and owners can do all that, as well as manage permissions. Box lets licensed users share folders and files with other licensed users without restriction. If you set the appropriate permission, they can share outside of your organization, too. To share you just need to click the “share” button that corresponds to an object to send an email invite or create a link. Anyone with the link can view and download your content. Sharing folders and creating content links can be dangerous because it’s hard to keep track who shared what and who has access to it. You can minimize that by password-protecting links and assigning expiry dates to them. Still, Box doesn’t have a separate page that lets you see the content that’s been shared. Egnyte Connect has a page like that and a strong approach to permission settings, so it wins this round. This category deals with apps you can use to boost your productivity, so the more you can use the better. Some services integrate with third-party apps, some offer native ones and others have a mix. Many integrate with Office Online or Google’s office suite while a few work with both. Unusually, Egnyte Connect has a native task management tool to help manage collaboration, but also integrates with third-party tools, such as Trello (read our Trello beginner’s guide). Plus, it can work with Office Online, Office 365 and Google’s office suite. You can boost workflow by using Zapier or Zoho Flow, for example. To improve your communication, you can use Slack, Google Hangouts or Workplace. For signing documents, Adobe Sign and DocuSign are available. Box doesn’t have a native task management app, but it has one for note taking, called Box Notes. Though it’s not as advanced as some of the best note-taking apps, such as Evernote, it’s still a competitor to OneNote and Google Keep. You can use it to take notes during meetings and discuss files with colleagues. It can also insert pictures and tables into your notes. Besides Notes, Box has a nice selection of third-party apps, the most important being Office 365, Office Online and Google’s office suite. For task management, there’s Trello, Aha!, and more. DocuSign and Adobe Sign are available, too, if you need to sign your documents. Another service, Asana, can help you define and reach your company goals (check out our Asana beginner’s guide). Egnyte Connect and Box have a lot to offer, including integrations with Microsoft Office and Google’s office suite. 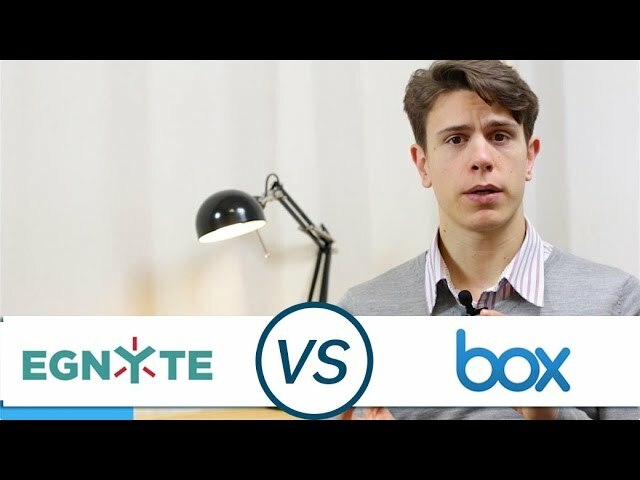 Egnyte Connect has a native task management app, while Box has one for notes. Both app libraries offer plenty of integrations, but Box offers more, so it wins this round. The online world has no shortage of crime, so having good security is a must for cloud storage services. They rely on several approaches to secure your data against threats, including the TLS protocol to stop man-in-the-middle attacks, at-rest and in-transit encryptions to scramble your files and private encryption to ensure their privacy. Two-factor authentication will stop hackers who’ve stolen your password from accessing your account. Even if a provider has it, though, you should make a strong password. Egnyte Connect uses AES 256-bit encryption to protect files on your local device, in-transit with the TLS protocol and at-rest on its servers. It isn’t zero-knowledge, though, because it needs to decrypt your files to read their metadata for indexing and to speed up the user experience. That said, after pulling the metadata, it re-encrypts your content. That’s standard for EFSS services, but you can protect your privacy by using Boxcryptor, a private encryption add-on. Just be aware that block-level sync won’t work if you use it. Local encryption is available for smartphones and tablets, too. Egnyte’s data centers use guard patrols, biometric controls and 24-hour surveillance to protect your data from physical intruders. If you don’t trust that level of security, though, you can take matters into your own hands by choosing to build a hybrid solution and storing your data on a personal server. That way, you can implement any security measures you want. The service uses two-factor authentication in case someone steals your password, but you can lower the chances of that by setting minimum password standards. You can also set password rotation requirements and account lockout parameters, as well as access centralized device management and Egnyte Key Management. Egnyte Connect lets you use single sign-on services to enable your users to connect to multiple business platforms with the same credentials, too. Available services include OneLogin, Bitium, Okta and Ping Identity. The service also has a feature that can cut devices off of sync, so if the device gets lost or stolen, you can make sure that the person who has it can’t access your cloud content. You can find more information in Egnyte’s security whitepaper. Box’s team isn’t lax with security, either, which is what you’d expect from a service handling businesses. Box uses AES 256-bit to scramble your data at-rest and the TLS protocol to protect it during transfer from your device to the data center. When it gets to the servers, the data is still scrambled. Box also uses key wrapping, which means it encrypts your key with the same level of AES. You can set up end-to-end encryption with Box using Boxcryptor, too. Single sign-on integration. is available via OneLogin and Centrify. Box has two-factor authentication to protect your credentials and lets you set custom password requirements for your users. That way, you can ensure they don’t create weak passwords in the first place. Device pinning lets you limit how many devices each user can sync. It also lets you check which are in use, so you get an overview of who has access to your cloud storage. You can unpin a device, but that only cuts access to your cloud storage. It doesn’t remotely wipe content that’s already on the device’s hard drive. For more details on Box’s security, read its whitepaper. Both services have excellent security so we had to split hairs when deciding the winner of this round. Egnyte Connect wins because it lets you implement your own cloud security using its hybrid solution and has the ability to remotely wipe data from synced devices. Storage should be a good value, which means you should get a lot for your money. Getting that is easier if a service has many plans you can choose from. If you’re looking for cheap plans, refer to our best deals in cloud storage. We like to see a free plan or trial, too, because you can use them to test the service. Egnyte Connect’s Team plan is good for one to three users. Though it targets businesses it’s good for single users, too. It costs $10 per user per month and provides 1TB of storage. The maximum file size is 10GB and you get standard support. It offers online case submission, product documentation, access to a knowledgebase and a forum and quick–start user and admin guides. It lets you call the API 10,000 times per domain. The Team plan also lets you integrate with Microsoft Outlook, Microsoft Office and DocuSign and allows for custom branding. You get administrative controls, such as user management, version history and custom URL access, as well. If you need to accommodate more users, you can choose between three plans: Office, Business and Enterprise. Office provides 5TB of online storage for $8 per user per month and requires a minimum of five users. The maximum file size remains capped at 10GB and you’re still limited to standard support. The plan has the same features as the Team plan, but accommodates more users and increases the allowable number of API calls per domain to 100,000.
Business gives you 10TB of storage for 25 to 100 users at a rate of $15 per user per month. It expands the Office plan with mobile security, the ability to sync local storage to the cloud and its advanced security package, which has report auditing and advanced authentication device controls. Local storage may include network-attached storage or NAS. You still get standard support, but the premium support becomes an option, too. On top of the standard support features, it provides a deployment and best-practices kick-off meeting and telephone support. The number of API calls is increased to 250,000 per domain, but the maximum file size is still capped at 10GB. If you have more than 100 users, you have to contact Egnyte about its Enterprise plan. It provides “up to unlimited” storage space and raises the file size limit to 25GB, which you can increase by contacting Egnyte. It also gives you access to platinum support, which prioritizes you for online and telephone case submissions and notifies you of early product releases. On top of that, you get an administrative package that has the Lightweight Directory Access Protocol, single sign-on and role-based administration, Egnyte Key Management and the option to access Egnyte Archive. The number of API calls is increased to 500,000 per domain, too. You can see the full list of features for all plans on Egnyte’s pricing page. If you’re not sure Egnyte Connect is a good fit, you can test the service using its 15-day free trial period. Box’s first business plan is called Starter and it costs $5 per user per month. It works for three to 10 users and caps storage space at 100GB. The maximum files size is 2GB. Using Starter, you get SSL and at-rest encryption, standard business support, user management, version history, 25,000 API calls per month and desktop and mobile access. The plan is a good fit for small teams. The next plan, Business, charges $15 per user per month and is good for larger teams because it requires a minimum of three users without placing an upper limit on the number of users. It raises the maximum file size to 5GB and offers advanced security features. They include Active Directory, single sign-on and mobile security controls. Plus, it integrates with enterprise mobility management providers and adds custom branding, data loss prevention and the ability to form and manage user groups. The amount of API calls allowed per month is raised to 50,000, too. Learn more about the plan here. Business Plus costs $25 per user per month and advanced admin controls and unlimited external collaborators to the previous plan. Admin controls include full content visibility and management, as well as user activity tracking and admin role delegation. It also lets you use metadata and custom templates. You can dictate your own terms of service, too. Optional features include Box Governance, Box KeySafe and Box Zones. Box Governance supercharges your management and protection of content in the cloud. Box KeySafe lets you manage your own private encryption keys. Box Zones lets organizations with users in Europe, Asia, Canada or Australia use local data storage in those regions. The number of API calls per month remains limited to 50,000. If you’re an enterprise-level organization, you’ll benefit from the Enterprise plan, but you’ll need to contact Box to get a price estimate. The plan has compliances for HIPAA, HITECH and FedRAMP. It gives full content visibility and management, unlimited integrations, including data loss prevention and eDiscovery and workflow automation. It also enhances your security with password policy enforcement, document watermarking and device trust. It raises the API call limit per month to 100,000. Both services have many features that benefit small teams, big teams and enterprise-level organizations. Box has good deals, with unlimited storage included in all plans except the first, but Egnyte Connect offers more features for less money. This round goes to Egnyte Connect. Considering that Egnyte won every round but one, it has to be our overall winner. The service has strong security, capable sharing and content control options and block-level sync algorithm to speed up collaboration. That’s not to say that Box is an underperformer, though, as we had to split hairs in a couple of sections to determine the victor. Box Starter is good for small teams because it’s half the price of Egnyte’s Team plan. You should also go with Box if unlimited storage is important to you. What’s your take on this comparison? Do you agree with our choice of Egnyte Connect? Let us know in the comment below. Thank you for reading. Branko has a bachelor’s degree in software engineering and likes to write cloud storage, backup and privacy laws. Naturally, he thinks Assange and Snowden are champions of the internet age. In his spare time, he does all sorts of stuff, including photography, reading, salsa dancing and learning languages. He also likes barbecue, hiking, traveling and skiing. Favorite movie never made: Jodorowsky’s Dune.